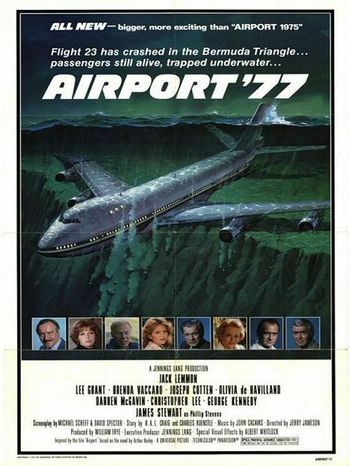 On the first flight of tycoon Phillip Stevens' luxury 747, art thieves mount a hijacking to steal the paintings being transported on the plane. However, they fail and crash the jumbo jet into the Bermuda triangle leading to the passengers being trapped underwater. The US Navy face a race against time and elements to save the passengers of the plane. Helicopter used briefly by Stevens at the start of the movie to fly into his estate. This plays the role of the Stevens corporation 747. If you watch carefully you will notice that two planes are used. At the start of the film when the plane comes into Dulles the plane has a black nose, in delivery of Northwest Orient Airlines, then a blue-white-red nose matching with an American Airlines airplane (see pictures below). Boeing 747-151 of Northwest Orient Airlines. Seen on the cover of an issue of "Flying" magazine that is briefly visible. Stevens Corporation 747 figured by an American Airlines 747. Registration N9667, c/n 20106/79 built in 1970. Reg. N9667 Boeing 747-123 of American Airlines. In reality a 747 would be likely to float on the water due to the cabin pressure rather than sink as it does here. US Navy planes used to search for the 747. All of Sea Control Squadron 41 (VS-41) "Shamrocks". Tail no. 159749, serial 394A-1078. S-3B BuNo 160125, serial 394A-1107, c/n 3125. US Navy helicopters used in the rescue at the end of the film. More than one is seen. All are from HSL-31 'Arch Angels' (Helicopter Anti-Submarine Squadron (Light) 31). Tail number 149036. C/N 40. Tail number 150185. C/N 135. Can't find a match for tail number 8186. Coast guard helicopter involved in the rescue mission. Another Coast Guard Helicopter seen early on. Same type. This page was last modified on 7 November 2018, at 00:47.